The Weavers Bastion is the part of the medieval fortification that is the most well preserved of all the bastions. This bastion was built in two stages from 1421 - 1436 (when three battle galleries were built with opening for cannons on the ground floor) and 1570 – 1573 (when the upper galleries were built to accommodate small arms and weapons). The tower is hexagonal shaped with a central courtyard that is the best spot to photograph the structure. The bastion has two watch towers that served as a lookout point for military reasons as well as for detecting fires in the city. Due to its near perfect acoustics, the bastion is also for opera performances- something no music and history lover should miss out on! 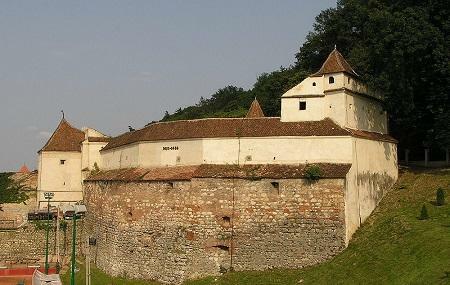 The 4-level structure is a heritage building and also has a museum where you can see a model of the Brasov fortress, a variety of weaver’s products and a different types of old weapons with Arabic inscription. The entrance isn’t that noticeable just a beautiful carved wide door. There was no one there when I arrived around 5.30pm (it closes at 6pm). So I just looked in the courtyard. Photos are 25 RON. I don’t know about entry. But when I went there was no one there and no ticket office. Pretty cool to see. This is a part of the old fortress of the town. Now it hosts a museum. And there they have a large woodden build city map. In summer this place also hosts different events like concerts and festivals. Do not miss it. Interesting to visit, quite small, so it shouldn’t take long. It is a bit uphill, on a remote street, be sure to use google maps. Interesting place also housing a model of the medieval town. Nice and quiet,no crowds during week time.